The Afro Future of World Music is Female! 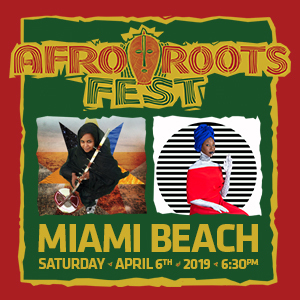 Miami Beach, FL – January 16, 2019 – The Afro Roots Fest concert planned for Miami Beach will be all about the feminine spirit of world music, featuring a double bill of African chanteuses and a team of local dancers. 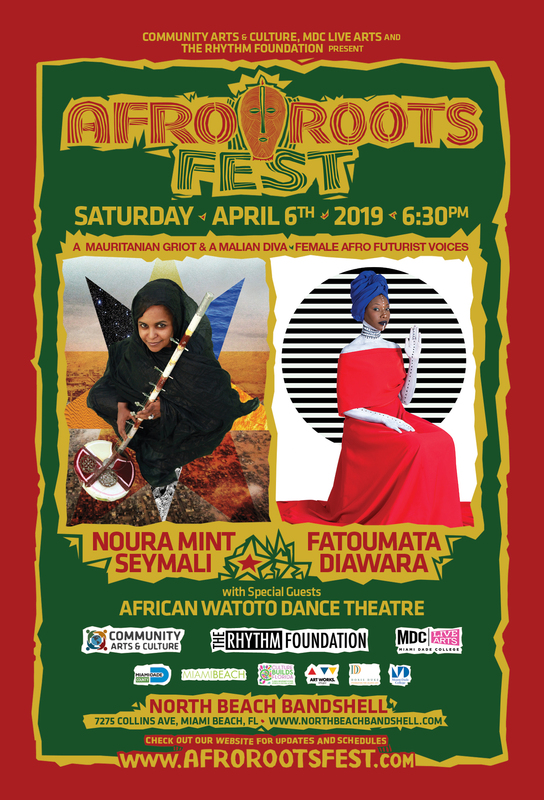 Mauritanian Griot Noura Mint Seymali and Malian singer / guitarist Fatoumata Diawara will perform at the North Beach Bandshell (7275 Collins Avenue, Miami Beach, FL 33141) on April 6, 2019, as will the African Watoto Dance Theatre. This is the first official concert of the Afro Roots Fest’s 21st season; doors open at 6:30 p.m. Pre-sale tickets are now available for $28 online through bit.ly/ARFMB19, and will be $35 at the door; all ages are welcome. Seymali is one of Mauritania’s foremost musical emissaries, and is known for applying the ancient musical traditions of the griot with a savvy contemporary aesthetic. Faithful to her Moorish roots, her sound is led by the raw music of the azawan, a word in Hassaniya that refers to the ensemble of traditional instruments in Moorish culture; the ardine, tidinit, guitar, and t’beul. She has recently collaborated with Damon Albarn, Baaba Maal, Tinariwen, SpoekMathambo, Oumou Sangare and Shabazz Palaces, and appeared at major music festivals throughout the globe. Born to Malian parents in Ivory Coast, Diawara is also a social activist and actor with an acclaimed movie credit (Timbuktu, 2014). Her music combines electric guitar lines with the ancient African strings of the Kora and kamel ngoni, and a drum kit blended with the timeless rhythms of traditional percussion. She’s touring in support of her latest release called Fenfo (meaning “something to say”), which is Grammy-nominated and features original songs that cover such timeless subjects as respect, humility, love, migration, family, and how to build a better world for our children. The release made the New York Times and President Barack Obama’s “Best of 2018” list, as well as the year-end lists in MOJO, The Guardian, The Sunday Times, and fRoots. She has also enjoyed several recent high-profile collaborations (Albarn, Herbie Hancock, SnarkyPuppy, Led Zeppelin’s John Paul Jones) and festival appearances. The African Watoto Dance Theatre is comprised of dancers from many genres of the African diaspora. The company’s repertoire includes original choreography in traditional West African dances, and Afro-fusion of modern and contemporary, Haitian folklore, Caribbean, Congolese Soukous, and storytelling. The company promotes the African arts specifically for the local communities that do not have access to an authentic cultural experience. High resolution images and videos are available. For more information, please visit www.CommunityArtsandCulture.org or call 305.672.5202. Founded in 1988, The Rhythm Foundation, is a not-for-profit cultural organization that is a foremost presenter of international music in the US. The Rhythm Foundation has presented concerts, festivals and events featuring over 800 established and innovative artists from around the world. Special focus is given to those cultures connecting to South Florida audiences. In 2015 The Rhythm Foundation began year-round management of the North Beach Bandshell amphitheater for the City of Miami Beach. This entry was posted in Blog and tagged afro roots, Miami Beach, world music. Bookmark the permalink.